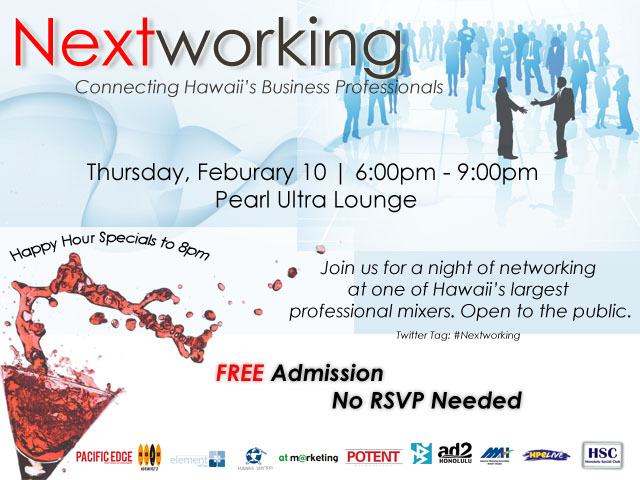 Nextworking, one of Honolulu’s largest young professional events will be holding a free admission networking mixer on Thursday February 10. Ten different organizations reach out to their networks for this quarterly networking mixer event. Enjoy Pearl’s famous happy hour specials, win raffle prizes (the grand prize is a trip to Vegas) and have the opportunity to grow your business connections. Past Nextworking events have welcomed over 300 young business professionals. Remember, there is no cover or pre RSVP, so please feel free to pass this Facebook invite to your network as well.